Yowie bait wrote: Yes lets all be open minded about everything...except Christianity and religion of course. But thats ok as they can handle it and have put up with it for thousands of years. Seems thats how the whole thing started in the first place anyway. Sure the differences in opinions and interpretations have caused more trouble than its worth but science is great at exploiting these things and providing more and more methods for us to destroy each other in a very cold and efficient way. Scientists signed the human races death warrant a long time ago. Really how long can we last with caches of nuclear weapons dotted all over the globe. Thousands of mines and oil drilling penetrating into the earth and poisoning our natural resources etc etc. What about the irresponsible and selfish experiments with chemical and viral warfare being carried out in sanctioned and non sanctioned labs the world over? These Christians who have theories on the nephlim giants or whatever have good reason. To them end times are near,giants are being reported. Look to the bible for answers and thats what you get. Fallen angels, nephlim etc. Its only logical. These transgressions are a result of mans sinful nature. Science is not to blame here. In the right hands, used with the right intentions, science has the potential for good. Is this the end of times as the Bible has predicted? I'm not entirely convinced that it is but I agree YB that there are a lot of concerns at the moment. Humans have a funny way of getting to brinkmanship then saving themselves from extinction over and over again. I'm not saying that this time will be any different but things are surely the worst they have been for some time. I just hope that if the Yowie does become revealed that they will be left alone. Science discovering this species has a very dark side....and it won't end well. Yes i agree. We could be living in a utopia with the talents and skills humans have developed. ChrisV wrote: Is this the end of times as the Bible has predicted? Yeah Chris we are a persistant bunch alright! I saw Steven Hawkins on the news saying we may not be around in 100 years or so and need to colonise. Bit of a worry he would say such a thing. Doubt it will change anything unfortunately. I wonder if technology will catch up with the yowie soon, with these gigapixel cameras and sattelite surveillance among other things. Lets hope the buggers never get one on a slab! Many 'top' scientists are warning of AI destroying the human race. In any case certain people very high up in the technosphere are spending their billions to hasten the Singularity for that will "make them Gods". It is also interesting to note that there has been an 'element' in every generation going back centuries, that has believed they were living in the 'end times'... ironically, they were all right... it was the end times for them (unless they reinarnated) as individual 'body suits'. A lot of Christians believe in ghosts ,UFOs they believe in God and seraphim(angels and cherubs)all supernatural entities so it's not a giant leap to also believe in yowies. Hi ChrisV, I think we are definitely in the last days, the Bible says to that day nobody knows but warns us to read the signs. Before that happens though a major prophecy has to be fulfilled and I will recognize that when it eventuates. Lozza62 wrote: A lot of Christians believe in ghosts ,UFOs they believe in God and seraphim(angels and cherubs)all supernatural entities so it's not a giant leap to also believe in yowies. You are right Lozza they do believe in ghosts, UFOs, aliens etc but their explanation would be entirely different from non-Christians. I think it depends on the theoretical framework we choose to project on things. One person might see a sign from God in the form of a light in the sky, another person might see a U.F.O. and maybe both of these observers will believe that their particular theory is the 'real' one and will refuse to accept any other explanation. Others might simply decide they've seen a Min Min light and think nothing of it. It depends on which intellectual 'software' you're using. It all depends on perceiving and interpretation based on beliefs, mixed with chemical effects in the brain from the foods you choose to eat, your medications, what liquids you consume, and what drugs you currently take or have taken. One hundred years ago when world war one broke out, some people thought things were so bad it must be the end times. A hundred years before that, some people thought things were so bad its the end times. The truth is, there is always at any given moment, a portion of the human race who think it is the end times. It's a quirk in the collective whole of the human race that a very small portion are like dead weights, consumed and obsessed with end of the world nonsense, which is totally counter-productive. Thankfully, the majority of the human race don't worry about such balcony, which is why we have such incredible technologies and living standards here in Western society at least. I don't even see how the end of times idea relates back to the yowie? Do some people see the Yowie as the herald of impending doom? Only if one has caught up with you and proceeds to rip your limbs off. Scarts wrote: It all depends on perceiving and interpretation based on beliefs, mixed with chemical effects in the brain from the foods you choose to eat, your medications, what liquids you consume, and what drugs you currently take or have taken. 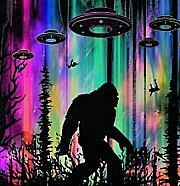 The Yowie has nothing to do with the ''end of time'' signs in the Bible Scarts but in my opinion, they may certainly be a contributor along with Bigfoot, Dogman and other cryptids. Well, I can assure you that 2.3 billion Christians or 32% of the world's population do. Sensesonfire, is 32 percent the current figure, and what's the figure been like in previous centuries? Also, of that percentage, what percentage of 32 percent really take it seriously or just have a passing thought about it every month? Also, you do realise when the bible was written, the people who wrote it had no conception of outer space, other planets, etc.? In fact, when the bible was written, 100 percent of people at that time believed the earth was flat and the sun and the stars orbital around our world. They believed we were the centre of the universe. 100 percent of that population including the bible loving, god fearing, were in fact wrong. We now know our planet rotates around a sun, which rotates with our solar system around another central body in the middle of a galaxy, which also in turn rotates around another central body. We are not the centre of the universe, and much of the bible's old testament, is either allegory or obsolete. The new testament is different, as it's a teaching for a way of living life, treating others, and offering a pathway to enlightenment. Scarts wrote: We are not the centre of the universe, and much of the bible's old testament, is either allegory or obsolete. The new testament is different, as it's a teaching for a way of living life, treating others, and offering a pathway to enlightenment. The whole religion vs. science debate is a non argument. Science is about the physical world while religion is about the spiritual. (i.e. flesh and blood vs paranormal) Both viewpoints have their frothing at the mouth adherents when all they're really fighting about is how things kicked off and what happens when you die. The real argument should be about preservation vs development. The real demon is money and the notion of possesion. There are no winners. Scarts wrote: Sensesonfire, is 32 percent the current figure, and what's the figure been like in previous centuries? Also, of that percentage, what percentage of 32 percent really take it seriously or just have a passing thought about it every month? Scarts, that figure was taken from the world's top ten religions of 2016/17. When you say the majority of the human race don't worry about such baloney I think you will find you are in the minority. If you take into account Islam's belief in the end of the world all be it different to the Christian doctrine, that's 2.13 billion people. So combined with the Christians that's more than half the world's population. Other religions also have a belief in an end time, even Native Americans and First Nations people believe it probably Australian indigenous peoples as well. You are correct in saying the New Testament is different to the Old Testament which was much to do with the law of the day and was mainly concerned with the Jews. The New Testament was for the gentiles as well as the Jews and is the guiding light in living in today's world but don't forget Jesus said Matthew 5:17 (KJVA) Think not that I am come to destroy the law, or the prophets: I am not come to destroy , but to fulfil . Gavin wrote: The whole religion vs. science debate is a non argument. Science is about the physical world while religion is about the spiritual. (i.e. flesh and blood vs paranormal) Both viewpoints have their frothing at the mouth adherents when all they're really fighting about is how things kicked off and what happens when you die. The real argument should be about preservation vs development. The real demon is money and the notion of possesion. There are no winners. The way I see it, and all theological and philosophical arguments aside, the Bible is a publication written by men, to understand and record events from a time and place a few thousand miles from Australia. Or China, or Tibet, or the Americas, etc. where our hairy folk are most frequently known to be inhabitants. I don't expect events from the middle east to snow all there is and be familiar with every creature that exists outside that environment. Science (the background from which I am from) is only interested in the things it can dissect, record, investigate and caollowtalogue. It is a challenge to get devout adherents of EITHER faction to accept anything which cannot be examined, and I am certain this will never change. Fortunately, in both groups. there are a number of individuals who have the curiosity and fortitude to look beyond the texts both groups follow. These explorers of knowledge should be applauded, or else mankind will stagnate. However, history has shown time and again how well received and treated they have been, so it's no wonder people choose to stay in the shadows in an aggressive climate. These creatures have been around for a long time and if mankind doesn't bollux up everything beyond belief, my bet is they'll outlast us too. It all comes down to belief. If established beliefs are threatened, people get shrill, outraged and unbelievably furious. Well, some do. That's a known effect of having things you hold closely as the core of your being and reason foe existence, turned upside down. Just remember that the key is to adapt, in whatever way you are capable, just as our natural world and the creatures, plants and environment have. Shazz wrote: Science (the background from which I am from) is only interested in the things it can dissect, record, investigate and caollowtalogue. I agree with what you wrote but your above statement is exactly why science is very limited, it can only deal in facts which in many cases leads to a dead end, especially when dealing with cryptozoology. Once a suggestion of the paranormal it's end of the road for science. Good example of science failing is the testing of Bigfoot hair samples while they can detect mtDNA the Y-DNA cannot be traced so an inconclusive result is posted. Definitely! If there is no precedent, science may struggle to find accurate links/causative factors as there is simply no data to compare evidence to. This of course, makes it an exercise in frustration, to say the least. The funny thing is that for those that have had encounters, we know science or religion is wrong about the yowies existence. They can make up all the condescending b.s they want. Mass hysteria, mistaken identity etc etc but it doesnt matter. They are wrong and probably are about a lot of things. Yowie bait wrote: The funny thing is that for those that have had encounters, we know science or religion is wrong about the yowies existence. They can make up all the condescending b.s they want. Mass hysteria, mistaken identity etc etc but it doesnt matter. They are wrong and probably are about a lot of things. Thats assuming of course that scientists aren't secretly researching the yowie. Theres enough information or evidence(if we can call it that) for thousands of level headed and intelligent armchair and field researchers to become firm believers so im sure some scientists have come to similar (secret?))conclusions.. The yowie is and always has been until the present moment, a persistent Rumor. Or a persistent possibility. It is as tangible or as amorphous as a gust of wind, you choose. Rumours as we all know, can take on a life of their own. The bible probably says something about spreading rumours does it not? If they do exist, they would have low self esteem because no one believes in them. That's right yowie bait, and everytime someone says "there's no such thing as fairies", another fairy drops dead. Reality really is highly personal isn't it? Scarts wrote: That's right yowie bait, and everytime someone says "there's no such thing as fairies", another fairy drops dead. Whoops, is there any way to bring them back after youve said it? Fairies can be such sensitive creatures. Especially compared to 'the other little folk', pictsies... little bastards sprint up your chest, grab you by the ears and headbutt you... according to Terry Pratchett anyway... but then according to him the mean little sods all have red hair, wear naught but kilts and talk like a cross between a scouts highlander and a 'traveller' (UK gypsies). These Faries and pictsies are not to be made light of. I have seen their skeletons on the fairy doco on youtube and they're terrifying. They even have wings and sharp teeth and look like something from the dephs of hell. Id rather have a run in with dogman or bigfoot than those evil little monsters. Yowie bait wrote: These Faries and pictsies are not to be made light of. I have seen their skeletons on the fairy doco on youtube and they're terrifying. They even have wings and sharp teeth and look like something from the dephs of hell. Id rather have a run in with dogman or bigfoot than those evil little monsters.